How to Stay Healthy during the Heatwave? As I write this post, I was sent home due to a viral infection. Its all started by last weekend extreme body heat. I end up on sick leave on Monday. I survive at work on Tuesday and Thursday despite being unwell. I was not able to sleep at all since Monday and when it comes to Thursday, I feel weak but still drove all the way to work. By the time reached the office car park, I realize making a big mistake to force myself out of the house. I survive in the office for barely 2 hours before feeling nausea and keep running to the ladies to throw up which is basically nothing out from me. I was coughing until the whole body feels super weak. I went to the clinic again and this time Doctor scolded me to be out of the home when I should be resting. Like that also can ar? Well, to be honest, I am not the only one to fall sick. Many others are facing the same problem with me. Its all due to the heatwave grips throughout Malaysia. The temperature rises between 37 to 40 degrees Celsius over at least three consecutive days. I heard this weather will last up to May. Hurl!!! Again...as online writer ( muahahaha...online writer my foot!!) I wish all of us to stay healthy and brave this heatwave. 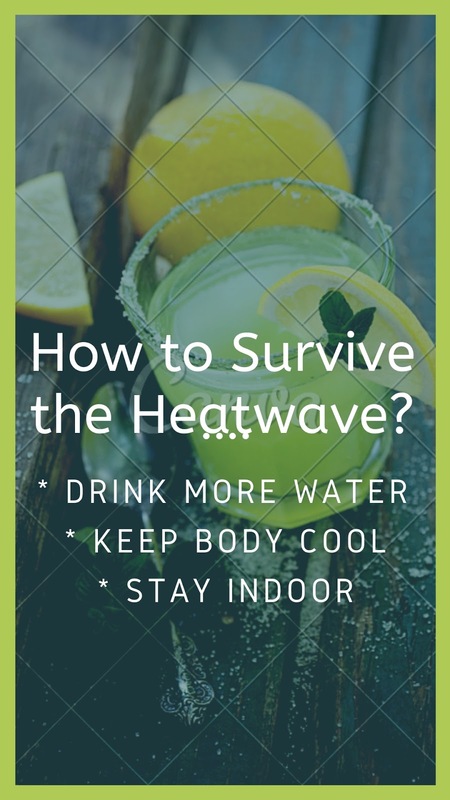 How to Stay Healthy during Heatwave? I think we heard this many times right? I drink plenty of water all the time. Try to lessen hot drink and drink more cold drink to keep your body cool. Try to reduce hot coffee and tea intake. Hurl! This is not a really easy task for me. I don't really drink cold. Avoid wearing a dark colour. But I fail to do this worrrrr... since my wardrobe colour is either black or dark blue. Damn! I need a wardrobe to revamp. Try to apply sunscreen and protect your head with a hat or don't let your head expose to the sun too much. Low down your shades to keep during day time to avoid heat and lift up the shades during night time to let in the cool air. It's ok if you don't have to air-condition at home. Just be like normal Malaysia people, you can always hang out in the cinema or shopping mall. Sharing is caring...try to be a good human like me..(hihihihihi) Don't forget to remind the people around you by encouraging them to drink more water and stay cool. Last but not least please stay away from heat and keep the body back in balance by input more fluids to your body. I am currently trying my best to take time to rest and recover. Stay healthy all! For those people who do the open burning during this heatwave....please wait for your afterlife judgement. Banyakkan rehat sis kalau tak sihat. Jangan stress. Minum air masak dengan kerap. Sekarang cuaca memang panas. Sy pun banyak berkurung dirumah. Thanks for the tips. I encourage my children to drink lots of water too to stay healthy. Tq for all tips , memang kena banyak minum air , bahaya panas melampau boleh jadi strok haba .. Yes good tips. Bila berlakunya mysim panas memang kena vanyak minum air suam u tuk mengelakkan dari berlakunya strok haba .Bila heatwave ni nak buat apa apa aktiviti di luar pun tak seronok, memang kena buat indoor aktiviti . Thank for the info. Lately memang panas. Dekat Kuantan ni dah lama tak hujan. Panas yanv panas terik tu. Memang kena byk minum air. I also wanted to write a suggestion post like this because the heat wave is seriously a killer this time. You wouldn't believe it but I always finish work around 3pm...and that's when the heat is at the highest, so whenever I get into the car, I can literally feel my face skin and cells not only tightening but also sizzling up. You can really feel the moisture in your skin vapourizing. Thanks for the sharing and caring. Indeed we need to be extra careful and the heatwave can be deadly. So everyone, do not forget to stay hydrated. Yup yup agree, really got to drink more water. Mouse mommy also put Guardian Vitamin C tablets that dissolve in water to drink it daily with 1000mg vitamin C for whole family members. You may try out too!